Welcome to Day 3 of our Hashtagitude Launch Series: Social Media Success! We’re halfway through the week, so gear up for the next few days with this tip. Don’t forget that on Friday (Day 5) we will have a special surprise for you all! Don’t go with the crowd and follow all the “popular” kids; just follow people YOU want to follow. Now that you have a uniform profile picture across all your social media accounts and have an idea of what kind of topics you want to post about, you want to work on finding people to follow/connect with. Besides your friends and family, you want to follow and connect with people and other brands that interest you and that may help your brand out in the future. There are a lot of articles all over the internet about who to follow on social media: influencers and experts, primarily. While you may find following these influencers and experts beneficial at first, you will find that after awhile their social media posts will flood your news feed and, once you actually try to interact with these influencers and experts, very few of them actually interact with you. Social media is about being SOCIAL. 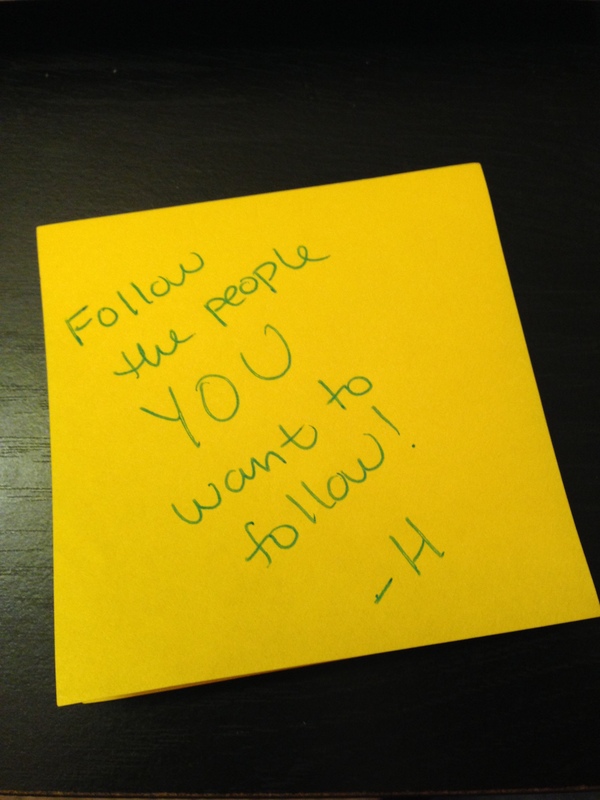 We emphasize this a lot here at Hashtagitude, so that’s why we recommend you to follow only the people that YOU want to follow. Have a friend who seems to follow a lot of interesting accounts? – You can easily follow your friend’s friends on Twitter through the tool Tweepi. Free to sign up and use, just type in your friend’s Twitter handle to pull a list of people they are following. Follow the accounts you find intriguing. When you gain new followers, check their follower/following numbers – How many people do they follow? How many people do they follow? I find it rare for people who follow over 3,000 people to interact with me, so I prefer not to follow many of these people back. I want to have actual interactions with people I follow. Next, check your new followers’ tweets (Twitter posts) – What are they posting? Are they actually replying to people or are they just posting news articles? Are they only posting promotional/salesy tweets? Be strategic about who you follow in this case: if you want your Twitter feed flooded with tweets only about news articles, then go ahead and follow these people. If you want tweets about your friend’s amazing promotion at work, then best to limit the number of content curators you follow. Avoid spambots at all cost! – You will get spammy followers, especially when you start posting more on Twitter. One way to tell if your follower is a spammer is to check what kind of tweets they post, while the easiest way to decipher between a spammer and a real person is the bio. If their bio says something along the lines of, “I can help you buy more followers!”, RUN THE OTHER WAY. What is your current following strategy? Answer in the comments below! Need more help figuring out your following strategy and want to also network with other likeminded professionals? We are now accepting applications for our first #ComeTogether Group Coaching session. Sign up now!